When someone launders your money do they also iron and starch it? Why yes, I am a dad, why do you ask? Nick Fox and Kate O’Hare are once again using Nick’s talents as a conman to take down criminals on the FBI’s list of bad guys. This time they are after a casino owner who is helping launder money for anyone from mobsters to terrorists. Given the company he keeps, is it any surprise he has a tank of piranha in his office for ‘negotiations’. 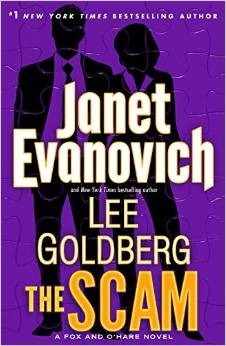 After being disappointed in the second instalment in this series, The Chase, I was unsure if I would read any more of the Evanovich and Goldberg series. I already had The Scam on loan from the library, so I decided to chance it. This was a rewarding decision as The Scam delivers an entertaining read. I was disappointed with The Chase because it felt like an episode from one of those will-they-won’t-they crime shows – such as Castle or Bones – during their declining years. You know, just as they are lining up the ramp over the shark cage. But The Scam felt like an early episode at the beginning of the series when Castle or Bones are still awesome, even though there are plot elements here that set this firmly later in the series (can’t say more without major spoilers). So skip The Chase and read The Scam. Previous Previous post: Book to Movie: Lord of the Rings – What’s the Difference?